1000 grain or 2.08 troy ounce each. 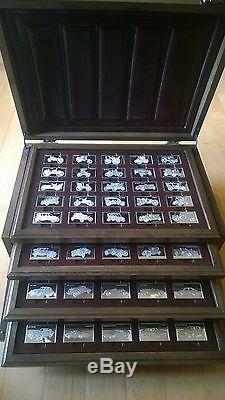 Solid oak chest, booklet describing each car, and certificate included. The Centennial Car Ingot Collection is an enduring tribute to the 100 greatest cars of the first century of automobiling. With the booklet, it is also an authentic record of the men and events that have shaped the course of automotive history in the first 100 years. From the world's first practical motor car, the 1875 Strassenwagen, and the first automobile made for sale to the public, the 1885 Benz, to the first car to be produced with an electric starter, the 1912 Cadillac, and perhaps the greatest American luxury car with its supercharged engine, the 1933 Duesenberg. This collection includes cars from 1875 to 1975. This collection was originally ordered from The Franklin Mint in 1973 by a friend of my grandfather, Gerald Easter. Both lived in Muskogee, Oklahoma, and my grandfather bought it a few years later. The ingots have been kept in perfect condition and rarely handled (with gloves only). I did not even clean the silver bars before taking the pictures. The item "STERLING SILVER CENTENNIAL CAR INGOT COLLECTION SET MINTED BY THE FRANKLIN MINT" is in sale since Saturday, April 29, 2017. This item is in the category "Collectibles\Decorative Collectibles\Decorative Collectible Brands\Franklin Mint\Other Franklin Mint". The seller is "9526stephen" and is located in Frisco, Texas. This item can be shipped to United States.